Nicholas Barasch is one of Broadway’s fast-rising young stars. He made his debut as the “Somewhere” soloist in the revival of West Side Story; he soon was opposite Chita Rivera in The Mystery of Edwin Drood revival; and then last season he won raves, the Theatre World Dorothy Loudon Award for Excellence, and Drama Desk and OCC nominations for his performance as eager delivery boy Arpad in She Loves Me. Next, Barasch headlines Encores! revival of Big River as Huck Finn opposite Kyle Scatliffe as Jim, running February 8-12 at City Center. Here's a glimpse of their "Muddy Water" in rehearsal. 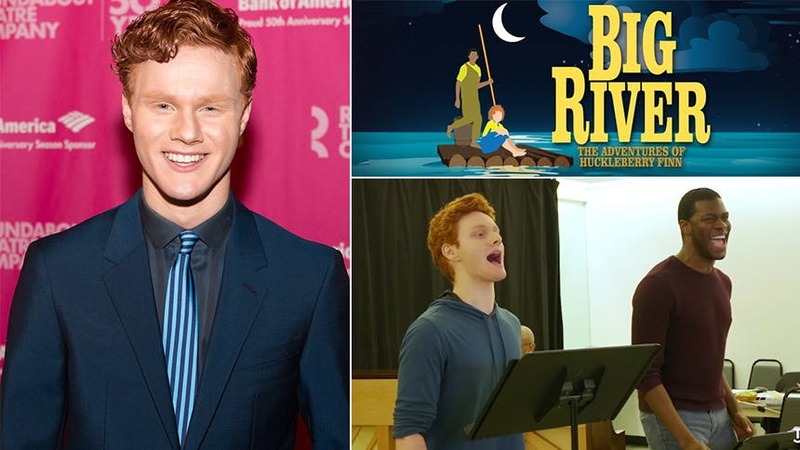 BroadwayBox caught up with Barasch to talk about the chilling immediacy of Big River, not taking yourself too seriously, and his own memorable Encores! experiences. 1. Now that you’re in the thick of rehearsals, what excites you most about this production of Big River? There are too many things that excite me about Big River! Our stellar cast, the iconic characters, the emotional rollercoaster of a story, the venue. But if I were to pick one thing, I would say the score. As I write this, I'm listening to our ensemble singing a hymn in the show called "How Blest We Are." Roger Miller's music is so rich and beautiful, it literally takes my breath away. And it's as much fun to sing as it is to listen to! 2. The She Loves Me experience must have been so wild for you, being showered with accolades, awards, and nominations. What did you do to stay centered and grounded through that? The recognition came as a wonderful surprise. I found it helpful to talk to other actors who have been recognized in that way, and I've learned from them that, while it is of course a tremendous honor, at the end of the day, it's about the work—you can't take yourself too seriously. 3. Is there a show you saw at Encores! that you’ll never forget seeing? 4. What are three TV shows on your DVR that you can’t get enough of right now? 5. Does revisiting this classic Huck Finn story feel any different or more immediate given today’s political climate? Lear deBessonet, our wonderful director, talked about this very topic on the first day of rehearsal. This story is, in her words, chillingly relevant. Current issues of race, equality, acceptance, freedom, and morality make this show perhaps more relevant than it's ever been. I think audiences will experience this show even more profoundly and intensely given the events post-November 8th. Don’t miss Nicholas Barasch in Encores! ‘Big River’ running at New York City Center February 8-12.